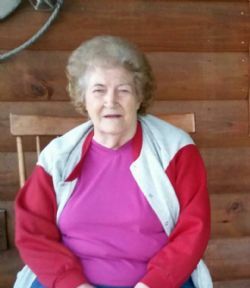 Arvella Marie Evans, age 84 of Zafra, Oklahoma, died Wednesday, July 4, 2018. She was born Thursday, March 15, 1934 to George and Bessie Threatt in Watson, Oklahoma. Arvella, affectionately referred to as Meme, was a loving wife devoted to her faith and family. She enjoyed church singings, where her smile brightened each time her husband played and sang. She loved pictures, flowers, and family gatherings. Arvella had a kind heart and extended love and grace to everyone she met. Arvella was a loving wife, mother, aunt, grandmother and friend and will be missed by all who knew her. Gratitude extended to the staff of Davita Dialysis who provide kind, loving care to Arvella over the past five years. She was preceded in death by her parents, George and Bessie Threatt; sisters, Rosa Mae Evans, Dessie Lawrence, and Angline Boyd and brother, JD Threatt. Arvella is survived by her husband of 67 years, Dwight Evans of Zafra; son and daughter in law, Donnie and Sherry Evans of Zafra; grandchildren, Rachel Fowler and husband, Nick, Andra Youngblood, Charlotte Wiles and husband, Clay, Tell Evans and wife, Nicole; special nieces and nephews, Valerie Wise, Ricky Evans, Clifford Evans, Jane Evans, Jana Carr and Brett Cunningham; cousin, Joyce Crane; nine great-grandchildren, five great-great grandchildren, many nieces, nephews, family and friends. Funeral services will be held Friday, July 6, 2018 at 2:00 P.M. at Bowser Family Funeral Home Chapel in Mena, Arkansas with Brother Bill McCourtney and Brother Todd Webb officiating. Interment will follow in the Pleasant Hill Cemetery in Hatfield. No visitation is planned. Pallbearers: Terry Plunkett, Clifford Johnston, Henry Bruce, Randy Oglesby, Garland Owens, and Quinton Owens.